Various ways of determining ambiguity of search queries exist for general search. Relevancy of result documents for searches however is not determined by the query alone. The current user intent is what drives a search and determines if results are useful. Intent ambiguity describes queries that might have multiple intents. Conventional disambiguation methods might not work in specialised search where a goal is usually similar or the same (e.g. finding job offerings in job search). Research described in this document investigates how to determine single and possible multi-intent queries for job search and how contextual information, especially backstories, affect the job search process. 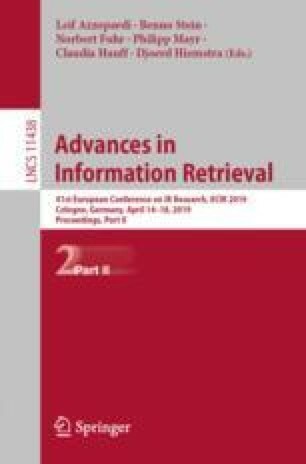 Results will lead to a better understanding of how important backstories and the handling of intent ambiguity are in specialised information retrieval. The importance of test collections with built-in ambiguity to better test performance will also be indicated. The proposed research is conducted with data from a major Australian job search platform. This research is partially supported by the Australian Research Council Project LP150100252 and SEEK Ltd.